After an active July 1st, Ken Holland turned to his list of restricted free agents and subsequently signed each of them. Now, Holland’s job is to be a man of his word to Red Wings fans. With refreshingly new comments after another disappointing first-round exit, Holland spoke about finally upgrading the blue line; which has been mediocre at best since the departure of Nicklas Lidstrom in 2012. In the past month, Holland has re-upped RFA defenseman Alexey Marchenko and Danny DeKeyser. Impatient fans heckled the length and money DeKeyser was given—six years, $30 million—but he can realistically be argued to have been Detroit’s top blue liner during 2015-16. Now, Holland has an overfilled roster that comes in roughly $750,000 under the salary cap—factoring in Johan Franzen’s $3.95 million and Joe Vitale’s $1.16 million cap hits on long-term injured reserve at the start of the season. Being so high against the cap, any possible trades have to be a near straight-up swap on the salary cap. With that being said, Holland’s obvious next step is to upgrade the defense with a top-pair defender. Let’s look at some potential deals for that player. Trade: Gustav Nyquist, Jonathan Ericsson, Axel Holmstrom and a 2017 third-round pick to Anaheim for Cam Fowler, Kevin Bieksa and a conditional 2019 third-round pick. In this blockbuster deal, the Red Wings would acquire 24-year old Fowler from the Ducks to bolster their defensive corps. While the analytics community is not a big fan of Fowler’s play thus far in his career, the young defenseman still has time to round out his game in both ends. He would join Brendan Smith and Mike Green as Detroit’s premier playmakers on the point, given his ability to jump into the play. Detroit would also receive veteran Bieksa, who would need to waive his no-movement clause (NMC) to complete the deal. Bieksa is an important piece of this deal—his NMC requires Anaheim to protect him in the upcoming expansion draft. And with Anaheim’s plethora of young talent on the blue line, they could protect Hampus Lindholm, Sami Vatanen and Shea Theodore with Fowler and Bieksa in Detroit. As was the case with P.K. Subban joining Nashville, the Red Wings would have the option to not honor Bieksa’s NMC upon his arrival—which they would do. Then, they could choose to leave him unprotected during the expansion draft. The conditional pick would go to Detroit if Fowler signs elsewhere during the 2018 offseason when he is scheduled to become an unrestricted free agent. In exchange, the Red Wings would send a trio of Swedes to Anaheim, centering around dynamic winger Nyquist. 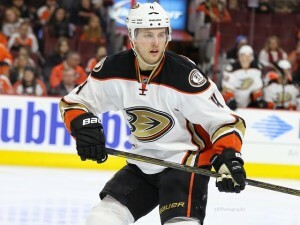 If he were to play for the Ducks, Nyquist would fit perfectly with Ryan Getzlaf and Corey Perry on the first line. It may seem far-fetched that another team would take Ericsson off Detroit’s hands, but the Ducks will do what they can to keep their young defensemen on the roster. Bieksa staying in Anaheim would likely result in Las Vegas taking a very talented player from Anaheim. And since Ericsson doesn’t have a NMC, he could be exposed without issue. To balance out of the trade, Detroit would have to part with Holmstrom and a third round pick. Holmstrom would not require protection in the upcoming expansion draft. Realistically, this proposed deal will probably elicit an immediate “no” from the St. Louis Blues’ side. 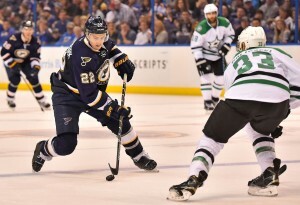 The team is most likely looking to land a centerman capable of playing on one of their top lines in return for Shattenkirk. However, I don’t think the value is that far off here, especially when you consider that the 27-year-old defender is an unrestricted free agent next summer. For that very reason, Red Wings fans might balk at moving a top-six winger with term on his contract and a defender with strong possession numbers for what could boil down to one year of Shattenkirk’s services. At the end of the day, the price to acquire a defenseman in the NHL is higher than ever, so Ken Holland is going to have to move something of substance. From Detroit’s perspective, the trade makes sense for a couple of reasons. While Smith is a UFA next season, it’s likely he would command close to, or more than, his current $2.7 million. Combining his potential cap hit for 2017-18 with Nyquist’s $4.75 million would give the team the space to sign Shattenkirk to a long-term deal. Additionally, if the team makes a move to improve their defense corps without sending a defender the other way, they run the risk of losing three defensive prospects on the waiver wire. As it stands, Xavier Ouellet, Ryan Sproul and Nick Jensen are no longer waiver-exempt and there is only one spot up for grabs on the Wings’ blue line. It’s not to say that any of those players are better than Smith is right now, but if Holland can land a legitimate top-four defender without losing assets for nothing, it makes the Red Wings’ situation all the better. Trade: Justin Abdelkader, Brendan Smith, Vili Saarijarvi and a 2017 second-round draft pick for Jacob Trouba and a 2018 third-round pick. At just 22 years old, Trouba is already a veteran of three NHL seasons. He plays to his size of 6-foot-3, 202-pounds and had he been on the Red Wings roster this past season, he would have finished second on the team in hits and would have led in blocked shots. In his rookie season, he scored ten goals and 29 points in 65 games. However, over the past two seasons, Trouba seems to have plateaued with 22 and 21 points, respectively. Still learning the NHL, Trouba’s ceiling has yet to be reached. While he isn’t at the level of Shattenkirk or even Fowler, he was a former ninth overall pick in 2012. Winnipeg already has a crowded blue line featuring names including Dustin Byfuglien, Tobias Enstrom and Tyler Myers. Being a lower-market team with an internal salary cap, the Jets can relieve themselves of negotiations with Trouba, as the two sides seem to be far apart. In return, Winnipeg gets Abdelkader, Smith and high defensive prospect Saarijarvi. Abdelkader would slot in as the top-line left-wing, joining only Nic Petan as the only natural left wings on the roster. Abdelkader would replace Andrew Ladd, who was traded away at the deadline and bring the same qualities to the roster. He’s a big, physical body that can chip in roughly 20 goals and 40 points. Abdelkader, 29, would be a leader and a veteran on a young team that is still building for the future. Smith, 27, was drafted 27th overall in 2007 and has played in parts of five seasons for the Red Wings. Smith, could be just what Jets GM Kevin Cheveldayoff has been rumored to be looking, a left-handed puck-mover to go alongside aforementioned right-handers Byfuglien and Myers. Smith also has relatively strong possession numbers and could blossom with a fresh start. He just can’t seem to gain enough confidence in his coach to step into a full-time role or even a marginally bigger role. Chosen in the third round in 2015, the 19-year-old Saarijarvi is a future replacement for Trouba. As a rookie in the OHL this past season, Saarijarvi finished tied for ninth in defensive scoring. He posted 12 goals and 43 points in 59 games on a Flint Firebirds team that was in limbo with seemingly endless internal problems.